At first glance, the world—with the notable exception of Europe—does seem to be marching steadily toward floating exchange rate arrangements. According to the International Monetary Fund (IMF), ninety- seven percent of its member countries in 1970 were classified as having a pegged exchange rate; by 1980, that share had declined to thirty-nine percent and, in 1999, it was down to only eleven percent.3 Yet, this much-used IMF classification takes at face value that countries actually do what they say they do. Even a cursory perusal of the Asian crisis countries’ exchange rates prior to the 1997 crisis would suggest that their exchange rates looked very much like pegs to the U.S. dollar for extended periods of time. Only Thailand, however, was explicitly classified as a peg; the Philippines was listed as having a freely-floating exchange rate, while the others were lumped under the catch-all label of managed floating. In this note, I summarize some of the key findings of Guillermo Calvo and Carmen Reinhart (2000), who analyze the behavior of exchange rates, foreign exchange reserves, the monetary aggregates, and interest rates across the spectrum of exchange rate arrangements to assess whether the “official labels” provide an adequate representation of actual country practice. To illustrate some of the main points, I present evidence for a few regimes that are drawn from the analysis of a much larger population of exchange rate arrangements. The data spans monthly observations for thirty-six countries during the January 1970-April 1999 period. Let, i, i* denote the domestic and foreign nominal interest rate, respectively, while E is the nominal exchange rate. The expected devaluation rate and default risk premia are given by å and ñ, respectively, and R denotes the level of foreign exchange reserves. The variance of any variable, x, is denoted by Var (x). Now let us first consider a floating exchange rate regime with a money supply rule, under which shocks to money demand, expectations about the exchange rate, or default risk are not accommodated. Under such circumstances, one should expect to see in the data that: Var(E) > 0; Var(i ) > 0, to the extent that there are shocks to the demand for money; and Var (R) = 0, as there is no central bank intervention. If, as in the United States, there is no explicit targeting of monetary aggregates, the exchange rate floats, and interest rates are smoothed, then shocks to money demand are accommodated, but shocks to exchange rate expectations or the default risk premia are not. In this case, Var(E) > 0, Var(i) = 0, Var (R) = 0, as money supply adjusts through open market operations rather than through purchases and sales of foreign exchange reserves. Hence, lack of credibility implies that Var(i) >Var(i*). 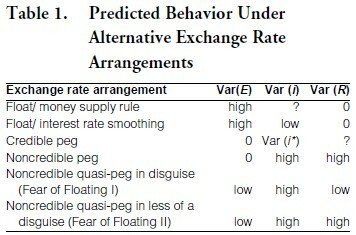 Having reviewed the theoretical priors of what to expect from the behavior of exchange rates, international reserves and, interest rates across exchange rate regimes (which are summarized in Table 1), we proceed to confront these priors with the actual data. Our data are monthly for thirty six countries in Africa, Asia, Europe, and the Western Hemisphere during the January, 1970-April 1999 period. Selected examples are presented here and the full range of episodes are given in Calvo and Reinhart (2000). Countries are grouped into four types of exchange rate arrangements according to IMF classification: peg, limited flexibility, managed floating, freely-floating. Limited flexibility has, almost exclusively, been used to classify European countries (prior to the monetary union) with exchange rate arrangements vis-a-vis one another (i.e., the Snake, the Exchange Rate Mechanism, etc.). Despite occasional bouts of foreign exchange market intervention, sometimes even in co-ordinated fashion, the United States dollar (US $) floated about as freely against the German Deutschemark (DM) and now the euro and the Japanese Yen (¥) as any currency is allowed to float. For this reason, we compare countries that have regimes that are classified as freely- floating or managed-floating against this “G-3” benchmark. Given well-defined priors for the behavior of exchange rates, foreign exchange reserves, the monetary aggregates, and interest rates across the spectrum of exchange rate arrangements, we proceed by examining these variables one at a time. In what follows, we analyze monthly percent changes. Table 2 presents evidence of the frequency distribution of monthly exchange rate changes (in percent). For the United States, for example, less there is about a fifty-nine percent probability that the monthly US $/DM exchange rate change falls within a relatively narrow plus/minus two-and-a-half percent band. 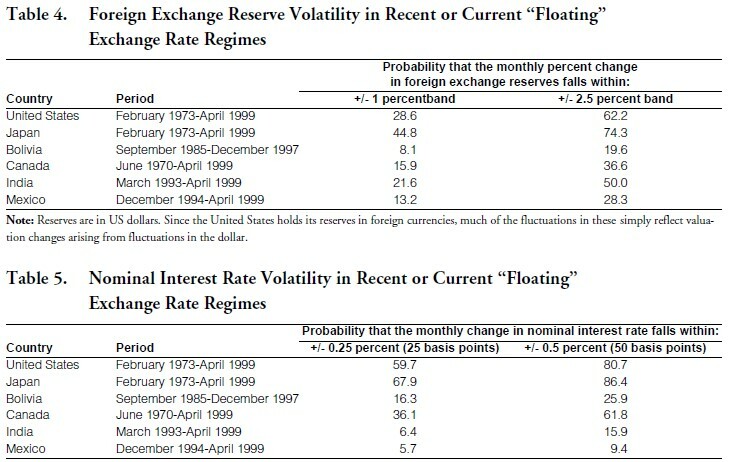 By contrast, for Bolivia, Canada, and India (all declared floaters during that period), that probability is in the ninety-four-to-ninety-six percent range.6 An alternative way of stating the same facts is that there is only about a five percent probability in those countries that an exchange rate change will exceed two-and-ahalf percent on any given month (versus more than forty percent for the US$/DM). 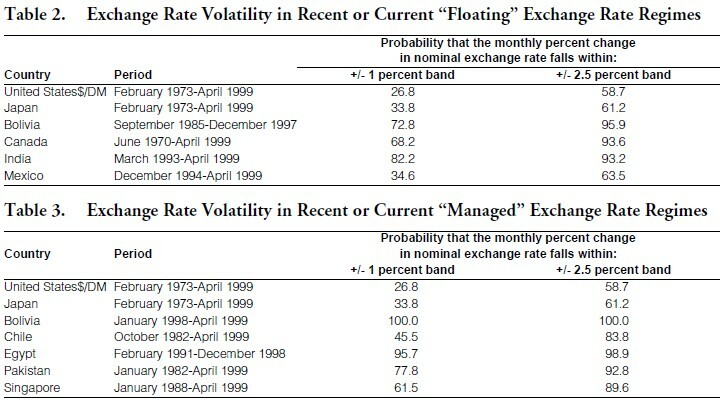 The absence of moderate-to-large monthly fluctuations in the exchange rate is equally absent among the so-called “managed float” episodes (Table 3). For Egypt and Bolivia, the probability of a monthly exchange rate change greater than two-and-a-half percent is nil. Even for self-proclaimed flexible-rate advocates, such as Chile and Singapore, the frequency distribution of their monthly exchange rate fluctuations relative to the U.S. dollar do not vaguely resemble that of the US$/DM or US$/¥, with a significantly higher proportion of observations falling within a narrow band. By this metric, post-crisis Mexico approximates a float more closely than any of the others—including Canada. As discussed in the previous section, however, exchange rates tell only part of the story. We cannot glean from exchange rates alone what would have been the extent of exchange rate fluctuations in the absence of policy interventions—that is, we do not observe the counterfactual. To assess the extent of policy intervention to smooth out exchange rate fluctuations, we examine the behavior of foreign exchange reserves. As Table 1 highlights, the variance of reserves should be zero in a pure float. In reality, reserves may also change owing to changes in valuation. Table 4 reports excerpts from the frequency distribution of monthly reserve changes (in U.S. dollars). With the exception of the United States, most countries in Table 4 hold the lion’s share of their foreign exchange reserve holdings in dollar-denominated assets, hence, valuation changes are not an issue. As Table 4 highlights, there is about a seventy-four percent probability that Japan’s monthly changes in foreign exchange reserves falls in a narrow plus/minus two-and-a-half percent band. In the case of Mexico, there is only a twenty-eight percent probability that changes are that small, while in the case of Bolivia that probability is even lower. Indeed for all other countries, large swings in foreign exchange reserves appear to be commonplace, consistent with a higher extent of intervention in the foreign exchange market— even relative to what is to be expected a priori from a freely floating exchange rate regime. Going beyond superficial classifications and taking the wealth of evidence at hand, if results are any guide to the future, promises and statements by countries to move in the direction of a floating exchange rate may be devoid of real consequences. There appears to be a widespread “fear of floating” that is closely linked with credibility problems. The root causes of the marked reluctance by emerging markets to float their exchange rates are multiple. When circumstances are favorable (i.e., there are capital inflows, positive terms-of-trade shocks, etc. ), many emerging market countries are reluctant to allow the nominal (and real) exchange rate to appreciate. This probably stems from fears of the “Dutch disease” type problems—loss of competitiveness and serious setbacks to export diversification. When circumstances are adverse, the case against allowing large depreciations becomes, possibly, even more compelling. The fear of a collapse in the exchange rate comes from pervasive liability dollarization, as in most emerging markets the debt of both the government and the private sector are largely denominated in hard foreign currency. For this and other reasons, devaluations in developing countries have a history of being associated with recessions, not export-led booms. Furthermore, the authorities may resist large devaluations because of their inflationary consequences and the credibility problems these may feed. If “fear of floating” continues to be the serious policy issue it has been in the past, and if, as the stylized facts on interest rates suggest, lack of credibility remains a serious obstacle, then the only way to simultaneously avoid the “floating and credibility problems” may be full dollarization. A corner solution indeed! 1. This article is reprinted, by permission, from the May 2000 issue of the American Economic Review. The author thanks Guillermo Calvo and Vincent Reinhart for very useful discussions and Ioannis Tokatlidis for superb research assistance. 2. See, for example, Morris Goldstein (1999). 3. Maurice Obstfeld and Kenneth Rogoff (1995), make this point as well. 4. See Calvo and Reinhart (2000) for a fuller discussion of why there is fear of floating. 5. See Atish Ghosh, Anne-Marie Gulde, Jonathan Ostry, and Holger Wolf (1997). 6. These patterns are representative of a broader set of countries, see Calvo and Reinhart (2000). 7. The results for real interest rates paint a similar picture; these are available from the author.